Dan joined the Good Morning America team on Wednesday April 30th to break down the latest in pop news. First up, GMA’s own Robin Roberts appeared on ‘Jimmy Kimmel Live’ to promote her new book “Everybody’s Got Something”, and we learned that Jimmy helped Robin in ways he maybe couldn’t have imagined. Next in the pop news heat index, Billy Crystal and Meg Ryan reunited years after their famous romantic comedy “When Harry Met Sally”, at an event honoring the film’s director. And what’s the latest YouTube video to go viral? 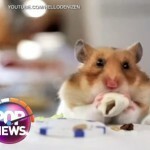 A little hamster eating tiny burritos prepared by his owner. You can watch the little guy scarf down three of these and the full clip of pop news by clicking here.